Autumn is upon us and the world has exploded with pumpkin-spiced…well… everything! Some of these foods are amazing and some are downright strange. (Pumpkin spiced gum, anyone?) We thought this would be a great opportunity to share some of my favorite yummy and healthy snack foods for the fall season. These healthy fall snack foods are a perfect fit for crisp autumn days. And yes…many of them contain pumpkin! Pumpkin pie is a Thanksgiving favorite, but there’s no reason that you can’t enjoy this treat throughout the entire fall season. Here is a Vegan Spiced Pumpkin Pie recipe that will help you create bite-sized pieces of ‘yum’ that you can grab on your way out the door. I limit my carbohydrates when I can so I would substitute in stevia for the sugar and make a simple crust using 2 cups coarsely ground walnuts and 1-2 tablespoon of butter. Mix the nuts until they are evenly coated and then press them firmly into the bottom of your cooking vessel. Regardless of how you make your crust, these pumpkin pie mini bites will delight your household. Pumpkins aren’t the only stars of the autumn season, so I had to include one non-pumpkin recipe. It’s also time for the apple harvest and all of the amazing recipes that can be created from this tasty fruit. 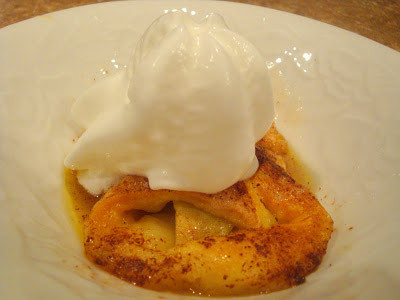 One of my absolute favorite treats to eat during fall is a warm apple dumpling with a scoop of vanilla ice cream on top. The warm flaky crust and cinnamon spiced apples create a perfect symphony of flavors. It’s better than apple pie in my humble opinion! Unfortunately, most apple dumpling recipes out there are horribly unhealthy. For example, a recipe from the Pioneer woman includes 2 sticks of butter, 1 1/2 cups of sugar and 2 cans of Mountain Dew soda! That’s why I was so excited to find this easy-to-make and delicious Apple Dumpling recipe from Deliciously Healthy. She does an amazing job of cutting out half of the calories from a typical piece of apple pie by substituting in apple cider and low calorie buttery spread. It’s easy to make and ‘deliciously healthy’ as promised. 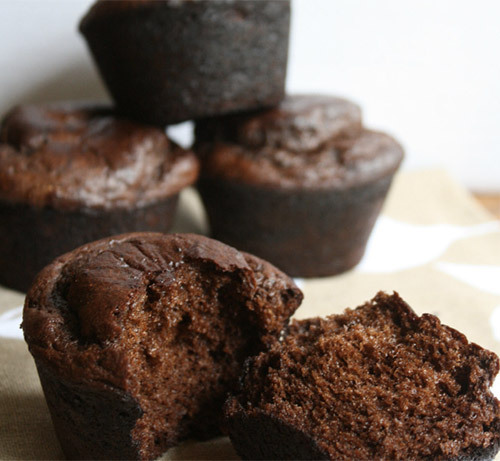 Chocolate Banana Protein Muffins…With Pumpkin Of Course! When I was rushing around in the morning to get ready for work, it was often most convenient to grab a PopTart or a store-bought muffin that I could shove into my mouth on the way out the door. As it turns out, these processed breakfast foods are not kind to my waste line. Take an Otis Spunkmeyer muffin for instance. Did you know that one of these bad-boys has 19 grams of sugar, 220 calories, and 9 grams of fat? That’s why I was thrilled when my friend suggested this healthier substitute. These Chocolate Banana Protein muffins are delicious on their own, but my friend likes to add some 1-tablespoon of nutrient packed chia seeds and 8 oz. pumpkin to spice things up for the season. Chia seeds are filled with fiber, antioxidants, and protein. The pumpkin adds a spicy tang to an already delicious recipe. I would recommend that you store any uneaten muffins in the refrigerator so they keep longer. They work well as a quick breakfast on-the-go or as an after-work-out protein punch. Pair a muffin with one of these other foods I recently wrote about that can help you focus better throughout your day! Halloween is coming and that means that pumpkins across the nation are about to be sliced, carved, and lit up to delight the neighborhood children. Why not save those pumpkin seeds to make a healthy and delicious snack? 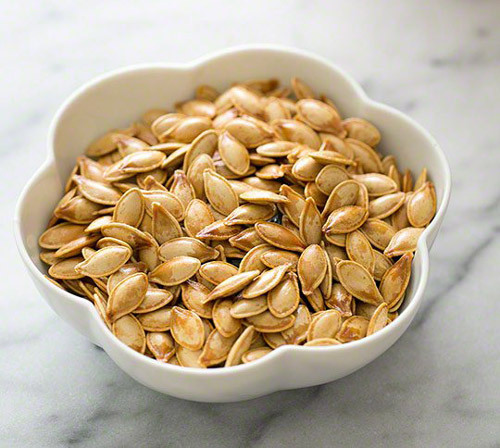 Pumpkin seeds are a great source of protein and also contain magnesium, potassium, and zinc. 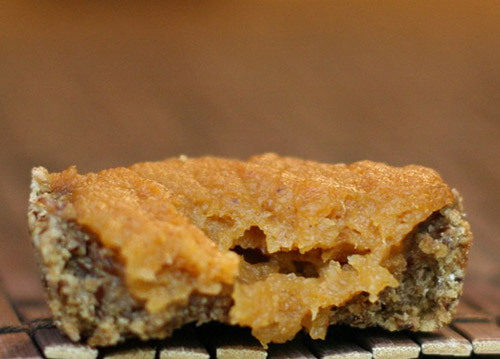 Check out this tasty recipe for when you need crunchy treat that is not chock-full of sugar. When mid morning hits, I often need a hot drink to wake up my brain so I can survive until lunchtime. 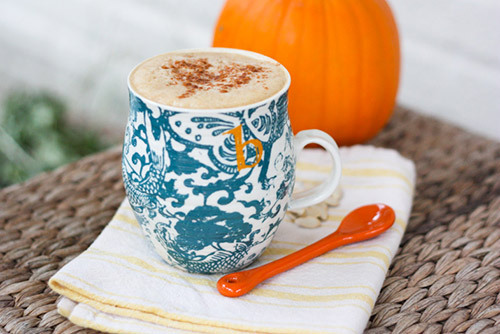 There is one drink that seems to epitomize fall beverages. Have you heard of the Pumpkin Spice Latte from Starbucks? Of course you have! What other coffee beverage makes national news each autumn? Did you also know that one grande latte packs 52 grams of carbohydrates? I enjoy my hot drinks, but not at the expense of that much sugar content! I found this much healthier version from EatingBirdFood.com so you can make your own café quality drink. Along with fall comes football season, and along with football season comes beer. It seems almost natural to incorporate beer along with apples and pumpkins to make the ultimate fall snack. 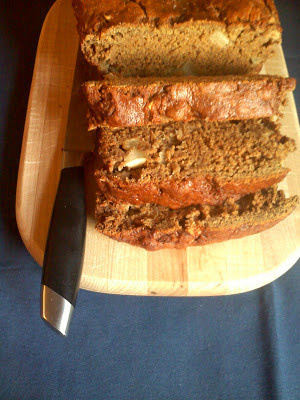 This recipe for Apple Pumpkin Beer Bread comes from a friend of mine at Choice Sustenance who is a wizard at creating delicious and healthy recipes. She uses all natural ingredients, which are stocked in her impressive basement pantry. Her basement also includes a magic beer fridge with a variety of tasty ales that could be used in this yummy recipe. Check it out! Here is one final sweet dessert that has been pumpkin-o-fied. 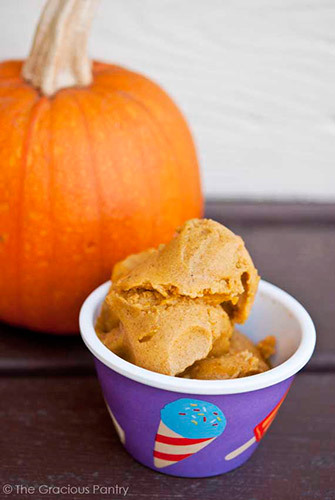 Regular ice cream like Ben & Jerry’s pumpkin cheesecake includes 15 g of fat and 25 g of sugar. There is a much healthier alternative and the secret ingredient is bananas. Not to be discouraged, I tried a second time. A friend suggested that I cut up my bananas, place them in a Ziploc to freeze, and then use a pantry hammer to crush the pieces before placing them in the blender. It worked beautifully! Here’s a version of the Pumpkin Banana Ice Cream from The Gracious Pantry that is perfect for fall. Just because a snack is delicious does not mean that it needs to be packed with extra sugar and fat. These healthy recipes will thrill your taste buds while being kind to your waste-line. So go out there and enjoy the fall season in all of its pumpkin glory! Do you have other favorites? Please share them in the comments section below.